A soccer tournament happening this week in Brazil has the potential to change the lives of its participants, and it’s not the World Cup. As that more famous tournament winds down, Football for Hope will give teenagers from 27 countries a chance to learn more about effecting positive change in communities and, of course, to play some soccer. Thirty-two nongovernmental organizations were invited by FIFA to take part in the Football for Hope festivities and be part of the World Cup experience, including Grassroot Soccer, which was founded by Tommy Clark, MD (D’92, Med ’01). For more than 10 years, Grassroot Soccer has been integrating the universal appeal of soccer with evidence-based HIV prevention and life-skills programs to give young Africans the knowledge and support they need to live healthy, HIV-free lives. Enjoying the quarterfinal match between Germany and France. 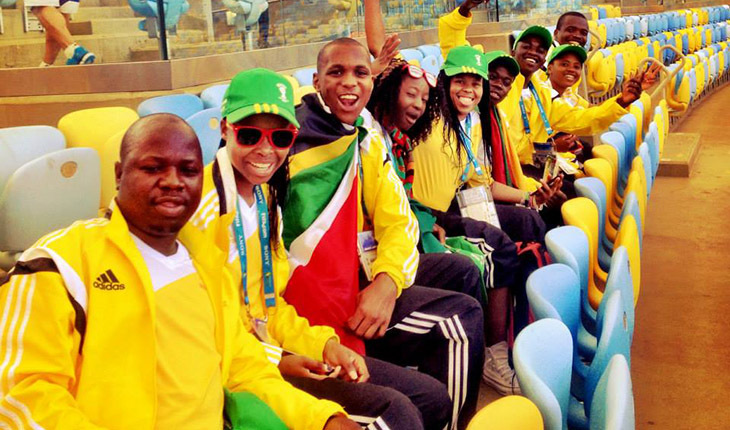 Chosen for their leadership potential, three boys and three girls representing Grassroot Soccer affiliates in South Africa, Zambia, and Zimbabwe traveled to Brazil for the event. The delegation also includes four young Grassroot Soccer staff members who are taking part in the festival’s leadership workshops. Fifteen-year-old Zizipho Maseko, from South Africa, loves playing soccer and says that the game is a good way to make new friends and to avoid the pressures young people in the community face every day. A graduate of Grassroot Soccer after-school program that empowers girls to avoid risky behavior and to protect themselves from HIV while giving them an opportunity to play soccer, Maseko is looking forward to bringing back to her community what she learns during the festival’s cultural and educational activities. Representing Bulawayo, Zimbabwe, the first and longest-running Grassroot Soccer program, 16-year-old Trust Rutaya is also happy about the festival. He says he is eager to meet people from other countries and to learn about their cultures—he also wants to learn about the world and how, as a future leader in Zimbabwe, he can uplift his country. And for Ngon’ga Mutale, an 18-year-old from Lusaka, Zambia, the festival is a “dream come true.” An avid soccer player, Mutale enjoys playing all positions and loves to score. She plans on studying law and would like to work at an embassy. Playing on a field in Caju, a community north of Rio de Janeiro, the mixed-gender teams comprised of players representing countries ranging from Australia to Vietnam are competing in a tournament without referees. Disagreements on the field will be settled through conversations that encourage personal development and mutual understanding. The tournament will also demonstrate the impact that a passion for soccer can have on social development goals and focuses on the values of fair play, respect, team spirit, and cultural diversity. “This is a chance to help showcase the power of soccer to make real social change,” Clark says. 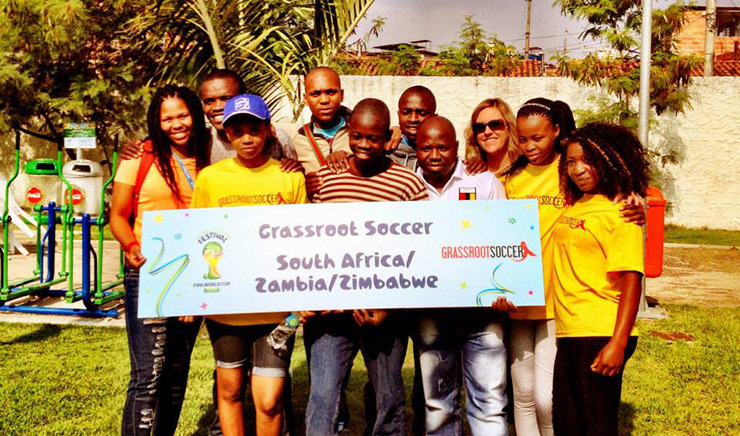 The Grassroot Soccer team in Brazil on the first day of the Football for Hope festival. Photo courtesy of Grassroot Soccer.